If you’re thinking about seeing The Weaker Vessels: Public Displays of Narcissism at the Toronto Fringe this year you should buy your tickets right now. Theatre Passe Muraille Backspace is a small venue and it was packed for Thursday’s opening show. The other thing you should do is heed the warning that the show contains sexual content and mature language. Please, don’t even think about bringing your kids. You might not want to bring your parents. The Weaker Vessels are Lance Byrd, Jeff Clark, Nadine Djoury, Matt McCready, and Colin Sharpe. Their comedy is smart. And bizarre. And raunchy. Most of it worked for me. There were a couple of sketches where I missed a throw away line and so missed the point. I loved the sketch with Nadine Djoury as the French substitute teacher and the rest of the cast as confused pupils. I’m not sure who Djoury was channeling, but she was terrifically bizarre. The sketch about the couple on their first date was actually quite poignant. They had puppet alter egos who voiced what they were thinking but not saying. The Weaker Vessels are all very funny. They’re also all talented actors. That’s something that I find makes sketch comedy enjoyable. I had a migraine, which tends to put a damper on my sense of humour, but tonight I laughed and had a good time along with with everyone else. The audience loved the show. They gave them the fastest standing ovation I’ve ever seen. I was really impressed at how fast everyone jumped to their feet. 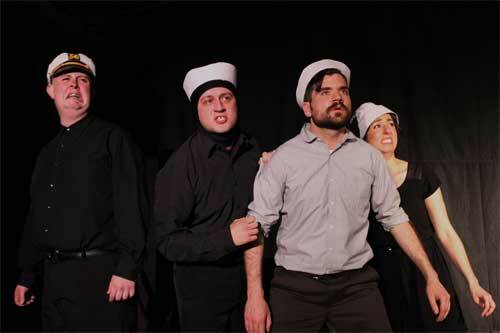 If sketch comedy is on your Fringe list, you should go see The Weaker Vessels. Tickets are $12 in advance, $10 at the door. The festival also offers a range of money-saving passes for serious Fringers.